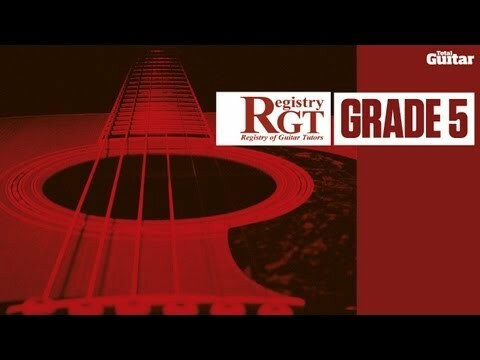 The ability to accompany a singer or another player is one of the essential skills every acoustic guitarist needs, hence RGT’s acoustic exams feature an accompaniment section as a core part of each exam. The examiner will play an eight bar melody on guitar while you’re given a chord chart that matches the melody to look over. The range of chords reflects the chords set for the grade. After you’ve heard the melody twice you must play through the chord chart, accompanying the examiner while he plays the melody twice more. You can use any style of strumming or fingerpicking as long as what you play suits the mood, style and timing of the melody. Below is an example of a Grade Five accompaniment test. At this grade barre chords may be required, although they need not be used exclusively. To obtain the best musical result and be awarded the highest mark, include some rhythmic variety so that your accompaniment doesn’t sound the same throughout. 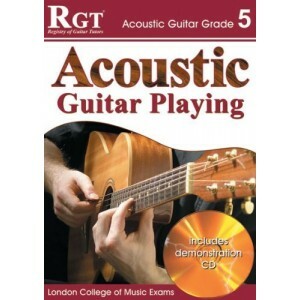 You can also click here to purchase the RGT Grade 5 Acoustic Guitar Exam Book, which contains all of the other musical requirements for this exam. Prepare by learning the chords set for the grade so that there are no suprises when you come to your exam. All of the chords in this chart can be played as ‘E shape’ or ‘A shape’ barre chords. D minor can easily be played as an open chord, which gives you a moments rest from playing barres. This is a typical Grade Five melody. Listen carefully to the Examiner’s initial play through and try to play an accompaniment that fits well musically with the timing and style of the tune. Notice that this piece is in 3/4 time. That’s the kind of key info you should pick up on during your first listen. To find out more about the Accompaniment Section, and the rest of the RGT Acoustic Guitar Grade 5 Exam material, please download the RGT Acoustic Guitar Exam Information Booklet. This entry was posted in Acoustic Guitar Video Lessons and tagged Grade 5 Acoustic Guitar by Alan. Bookmark the permalink.